Cork County Council is sponsoring a series of environmental public awareness days in conjunction with garden centres this May. The purpose of the Environmental Awareness Information Day is to promote composting of garden and kitchen green waste in an eco-friendly way. 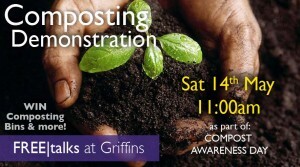 You are invited to attend composting demonstrations at Griffins Garden centre Dripsey at 11am on Saturday 14th May. Learn all about how to compost and in for a chance to win a compost bin to get you on the road to making your own compost.